MK 4000 - Deliver more! 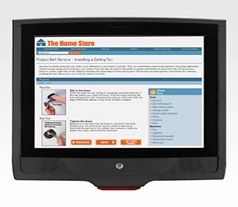 MK 4000 is a powerful full service interactive micro kiosk. It combines Motorola’s world-renowned bar code scanning technology, a large 12.1 inch SVGA touchscreen, high speed processor and robust memory architecture to enable delivery of a wide range of information and services in a multitude of industries. With a cost-effective connection to back-end systems and three USB ports for customization, this versatile device provides the features required to take self-service to the next level.